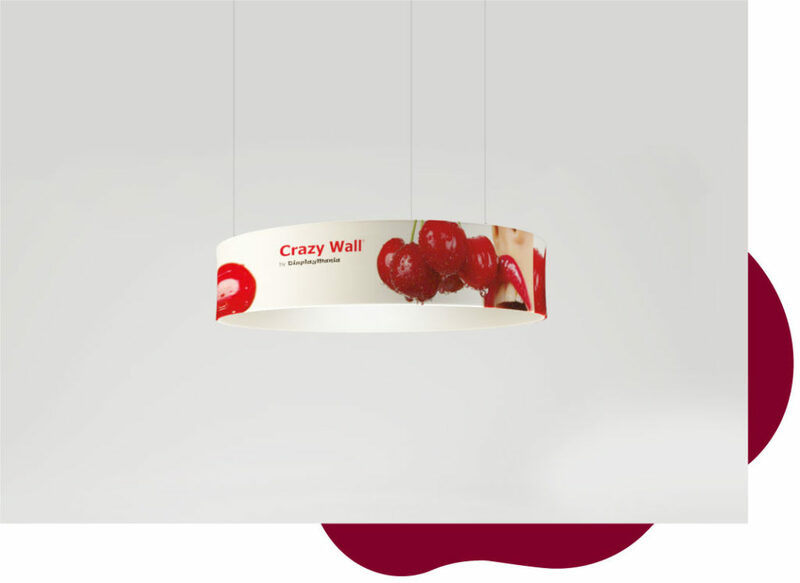 Curved and plastic shapes that adapt to spaces. 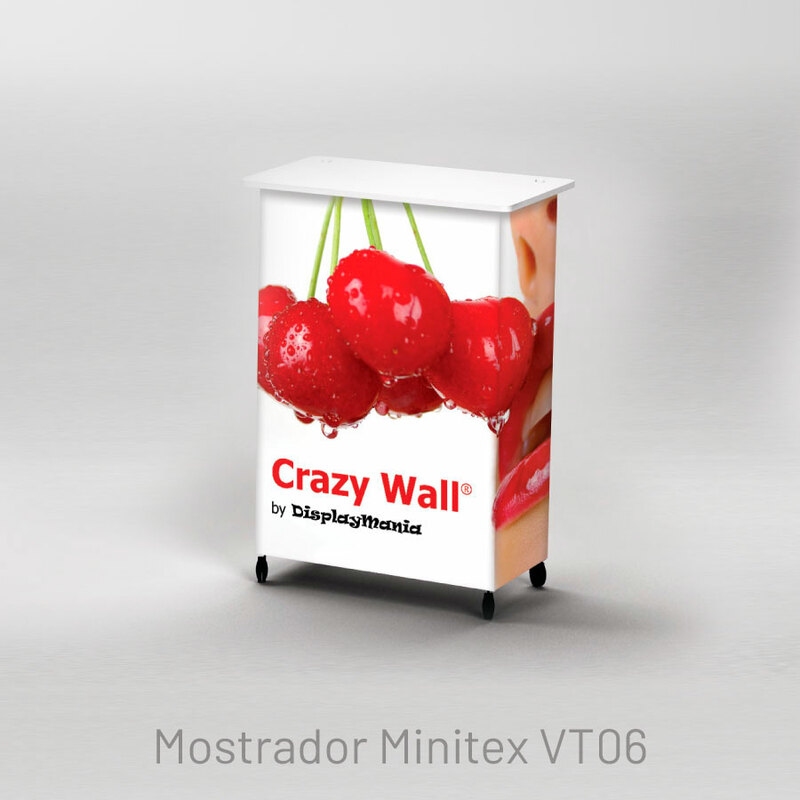 * OPTION VALID FOR THE BEST-SELLING MODELS. 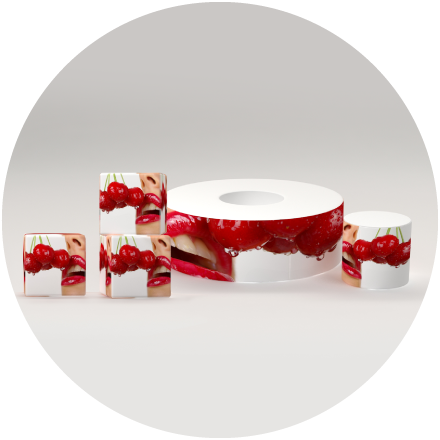 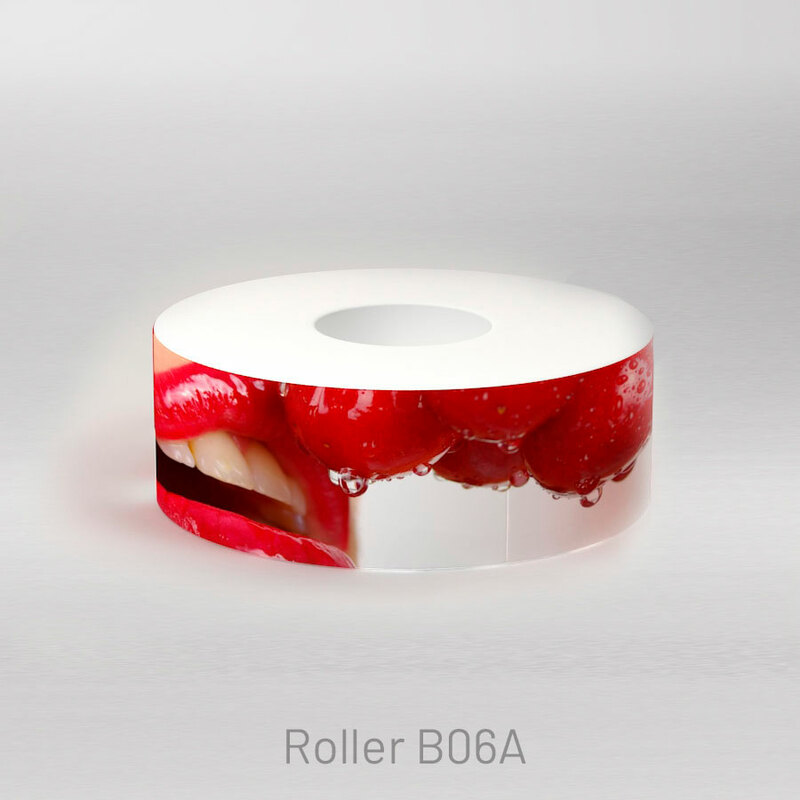 Different shapes and sizes, with connected parts for a quick and straightforward set-up with no tools needed, eco-friendly sublimation printing, concealed aluminium structures and transport cases that are converted into counters. 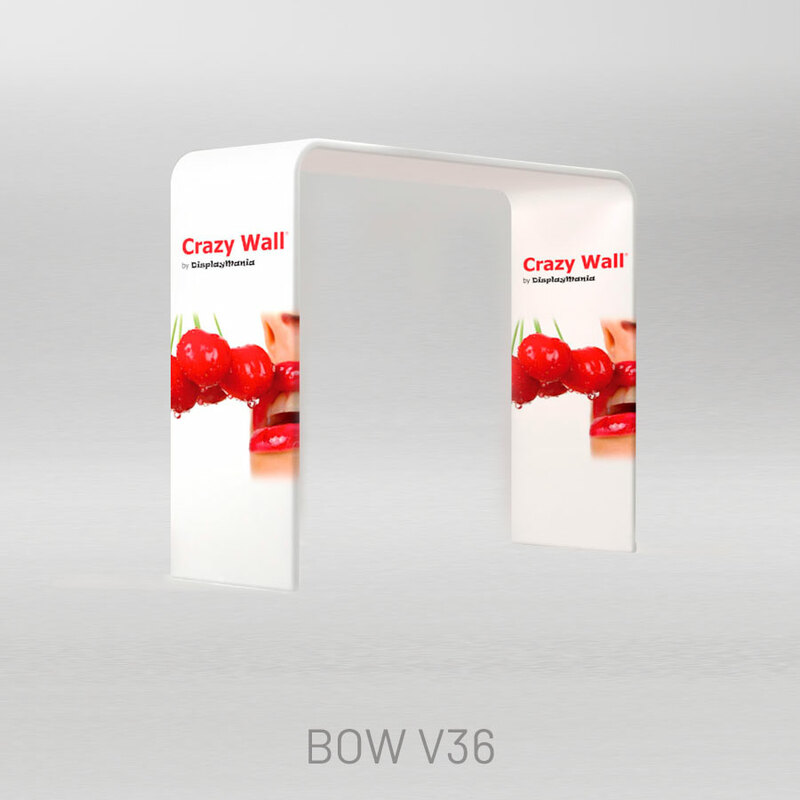 Our displays convey your brand’s values with clarity, elegance and originality at trade fairs, events and points of sale. 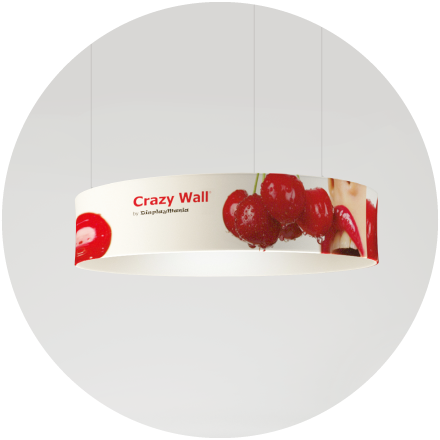 Make a big impact on your clients! 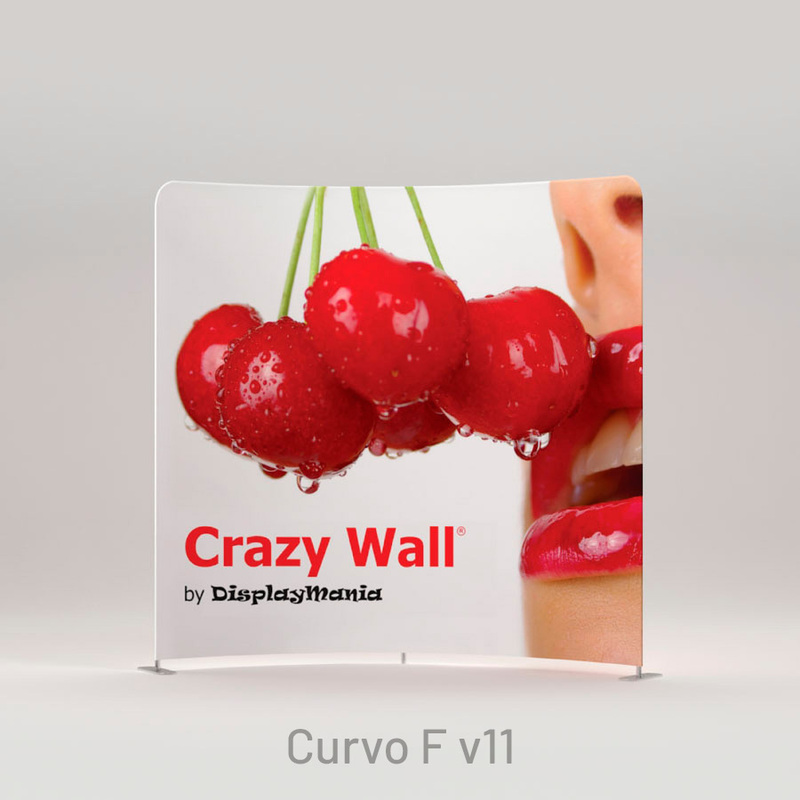 Large-format displays and different shapes designed to make their mark. 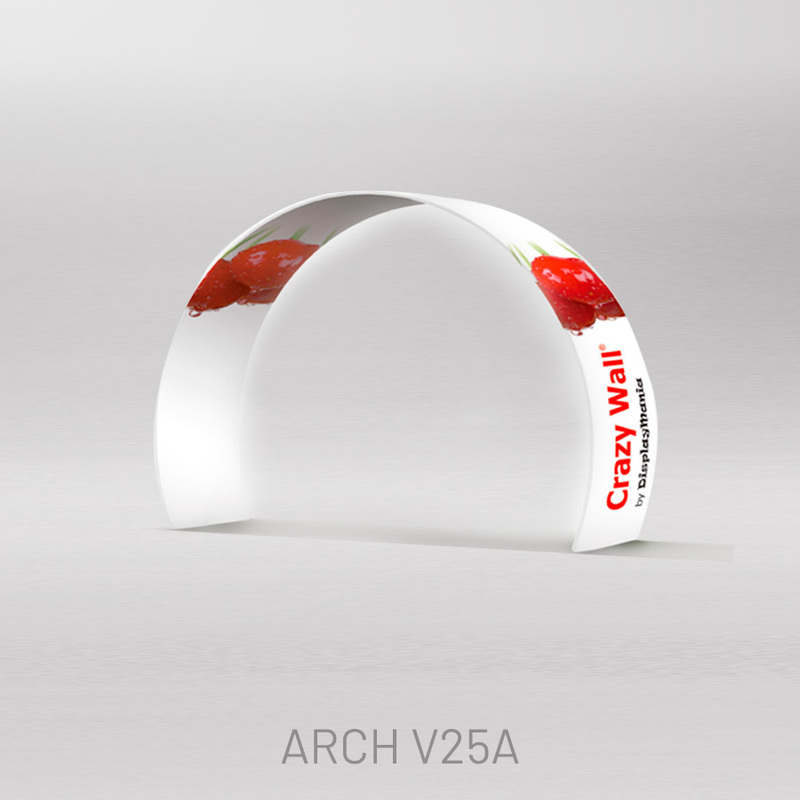 With components up to 6 m-long, printed on a single part, our structures look clean and clear, with no cuts or joins. 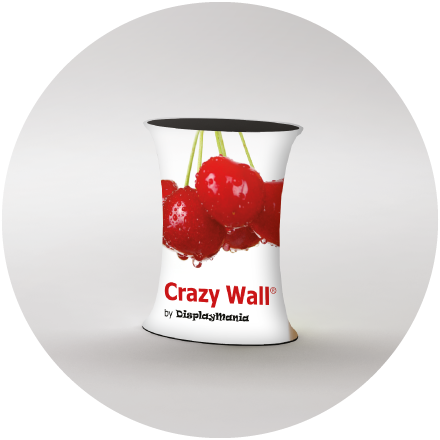 They are easy to transport and set up, with no need for tools. 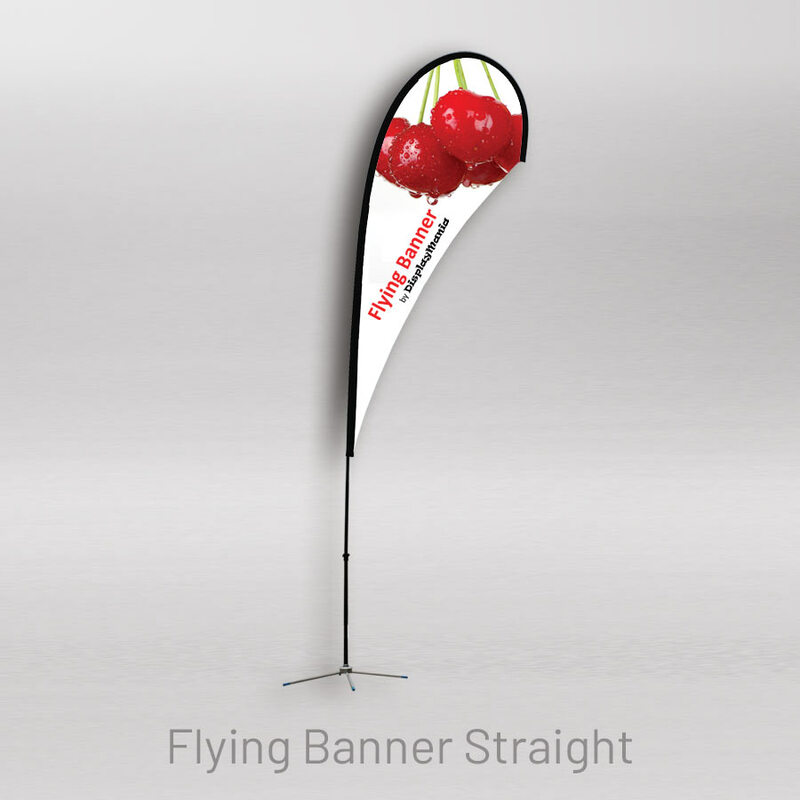 Our hanging banners provide elegance and visibility to your brand from any location at a trade fair, event or point of sale. 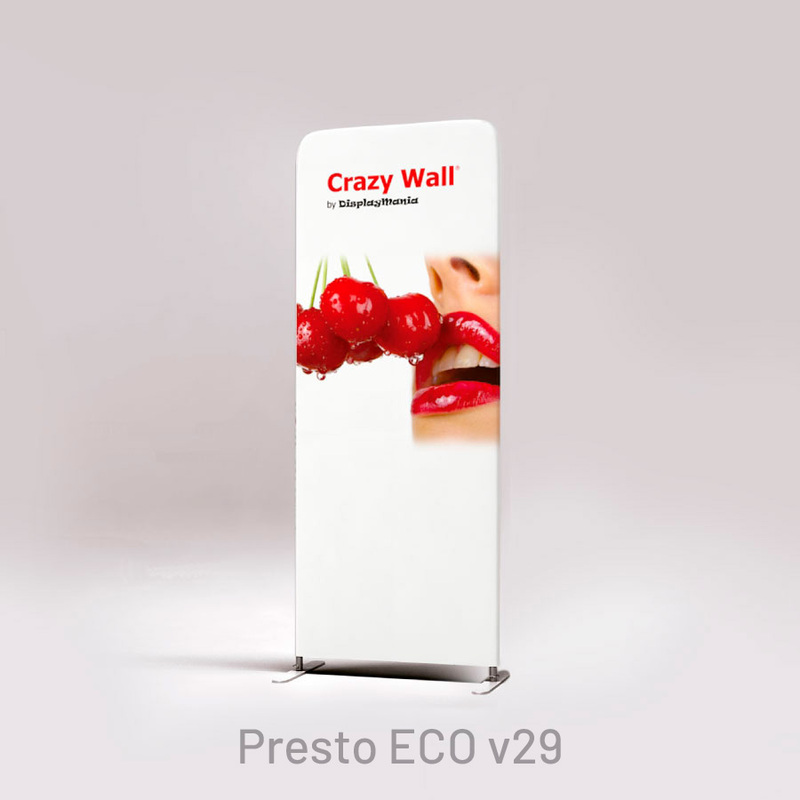 Weighing in between 15 and 20 kg, these collapsible hangers guarantee tool-free set-up and include fittings for hanging them at the top of the trade fair premises structure. 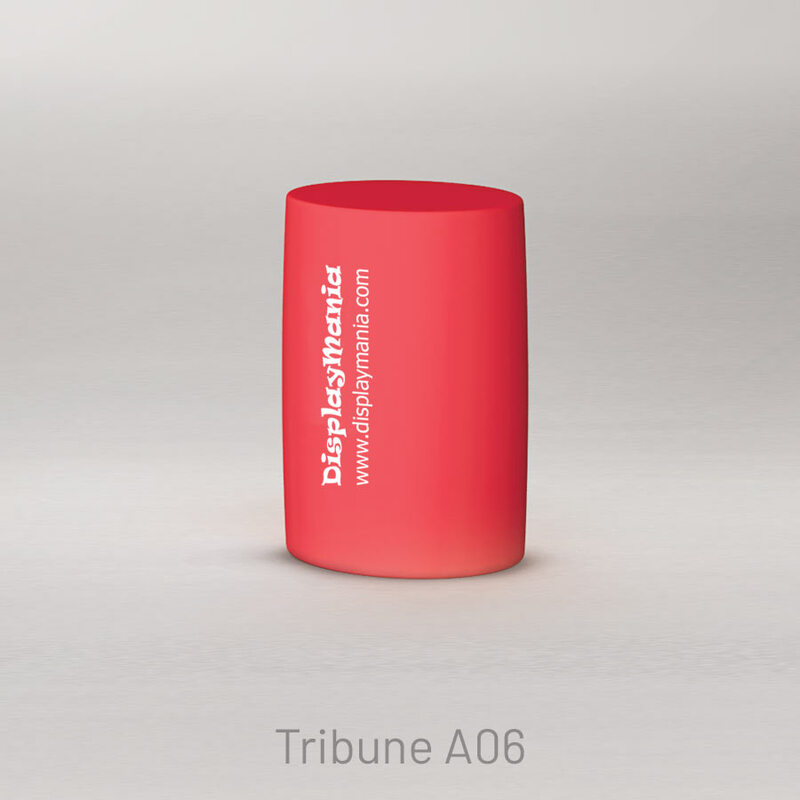 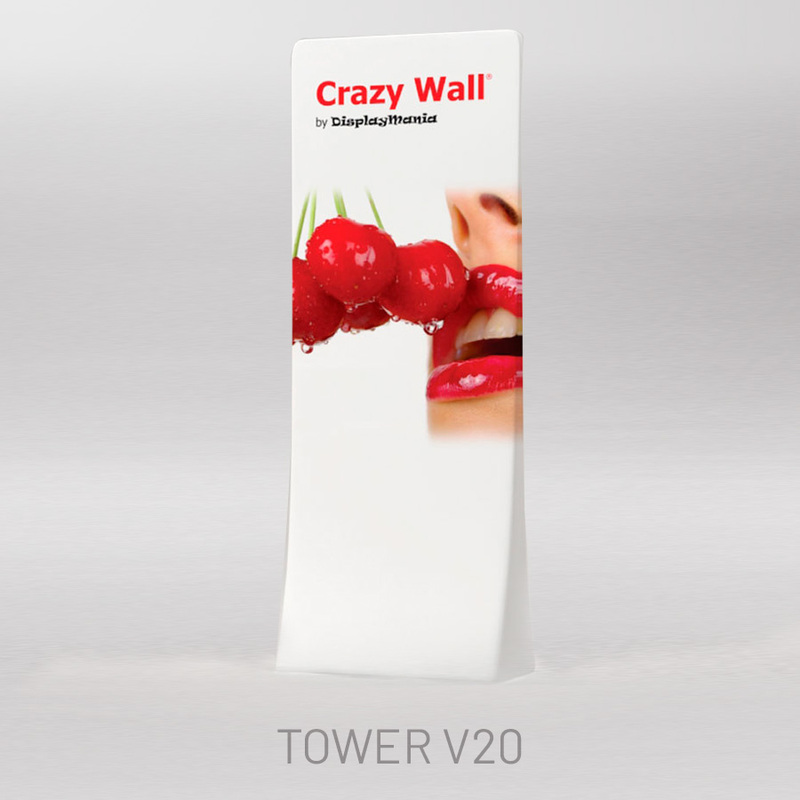 Their surface is 100%-printable on one or both sides, facilitating multiple print changes. 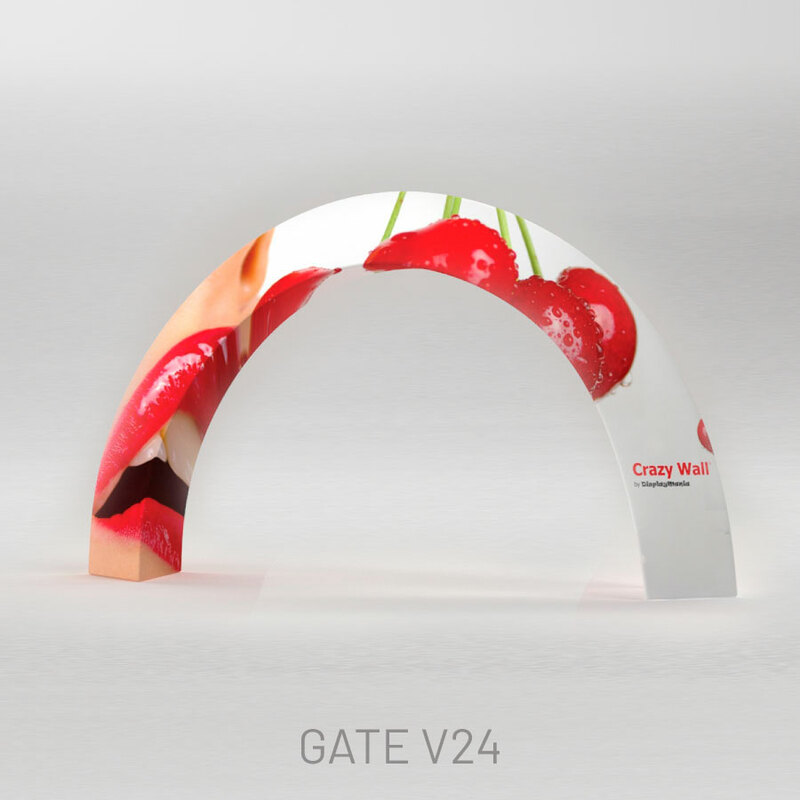 Personalise your stand to make your customer service a cut above the rest. 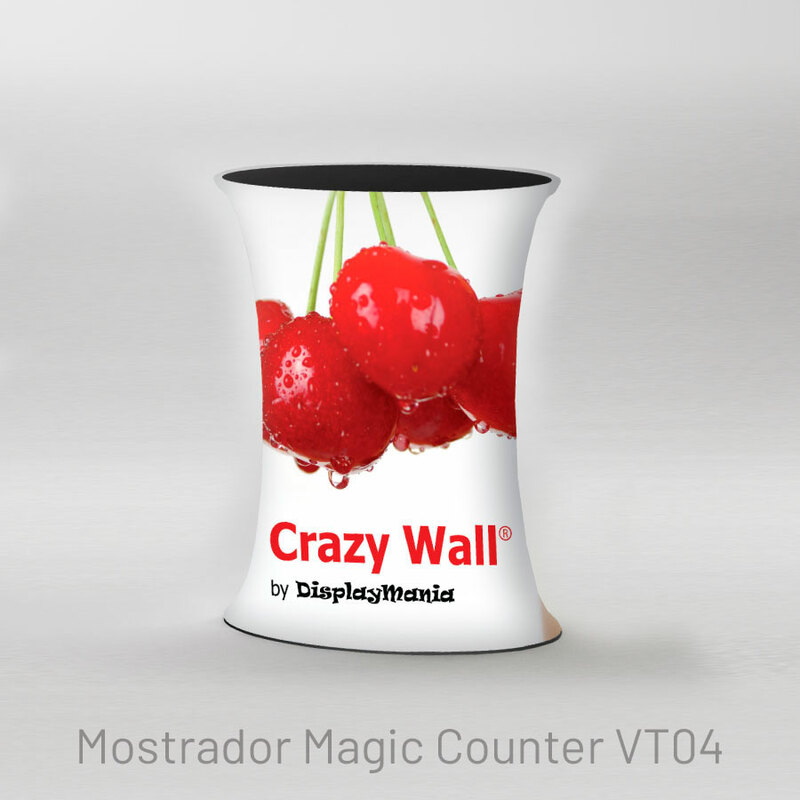 The Magic Counter is the new generation of portable and collapsible counters that set themselves up in 5 seconds. 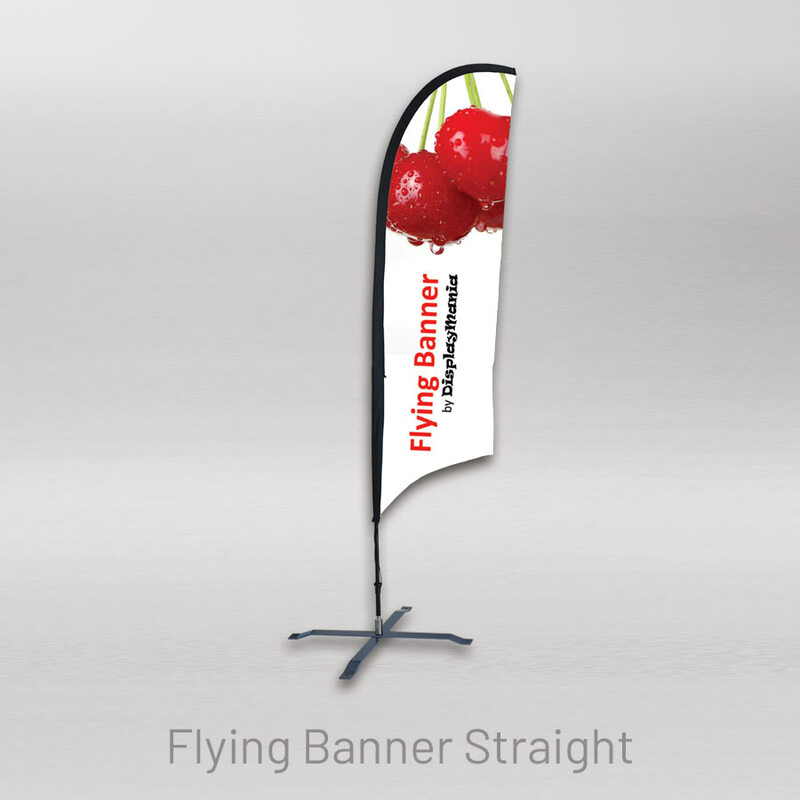 They are ideas for companies that participate at numerous trade fairs and events. 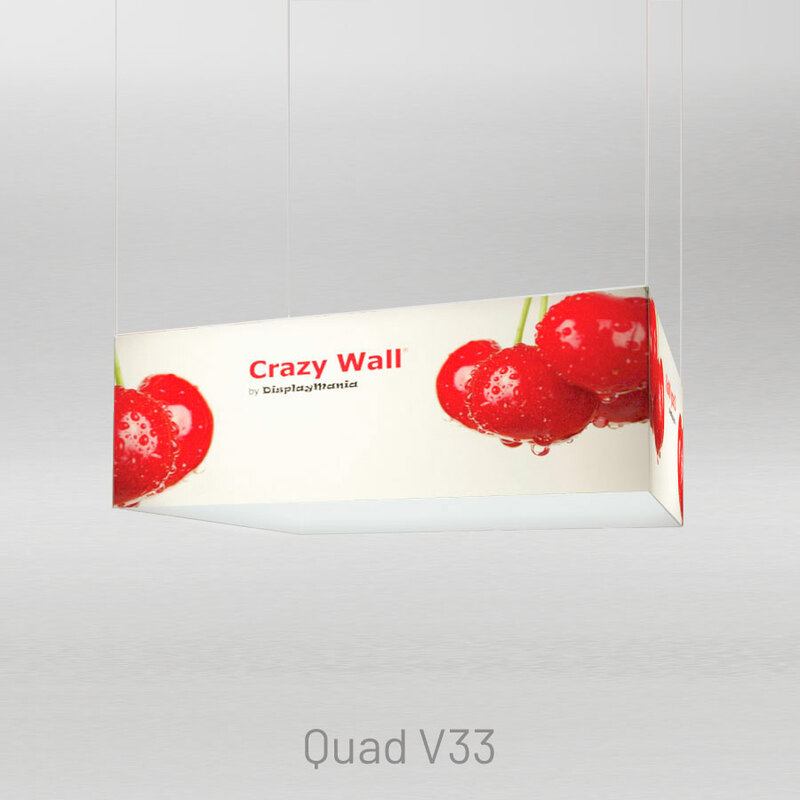 We also have models that feature inner LED lighting. 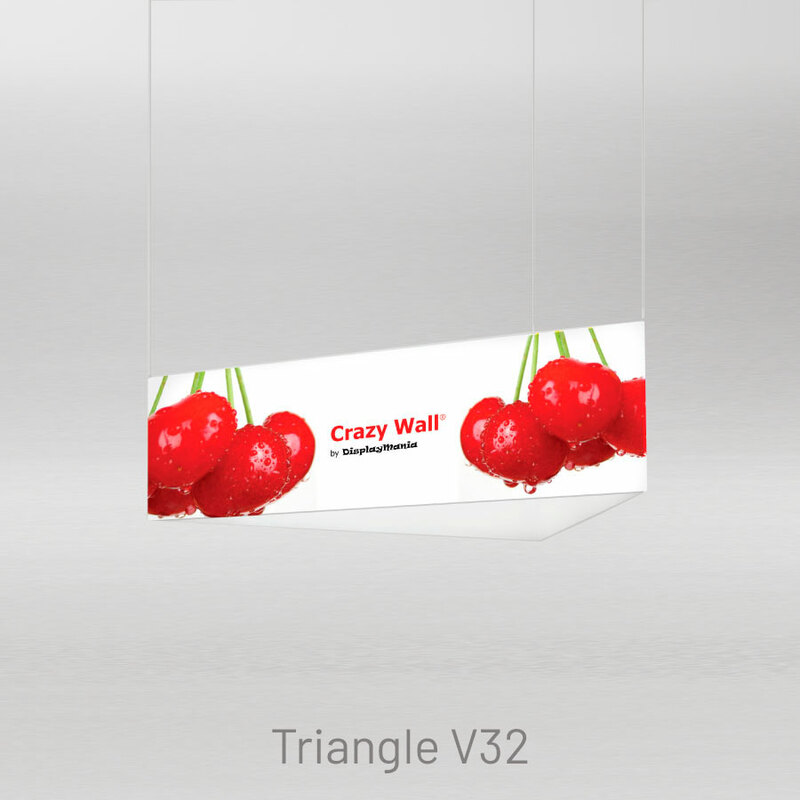 Would you like to know how our displays work? 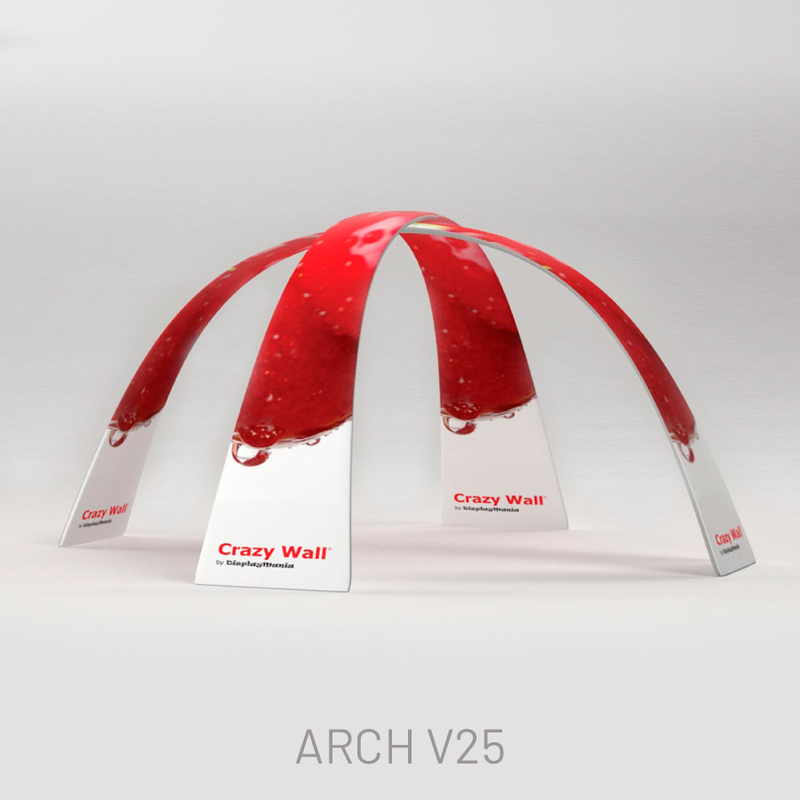 This video shows you just how easy they are to set up. 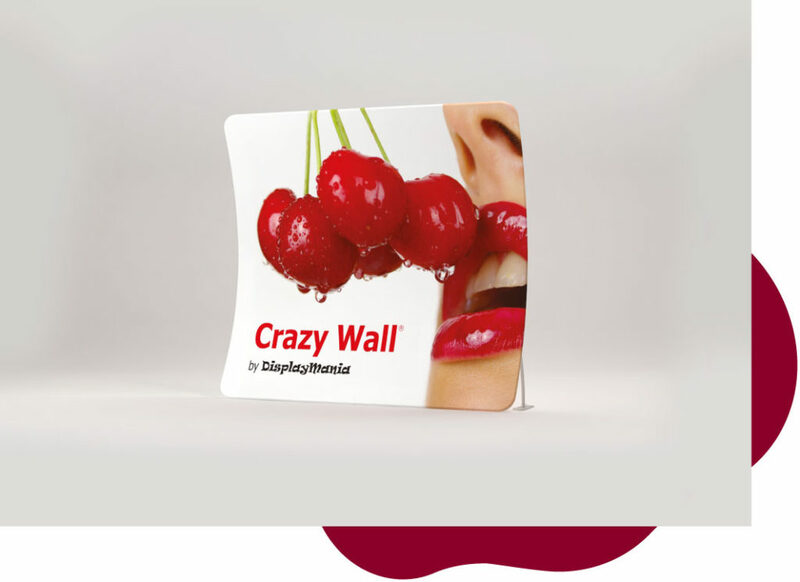 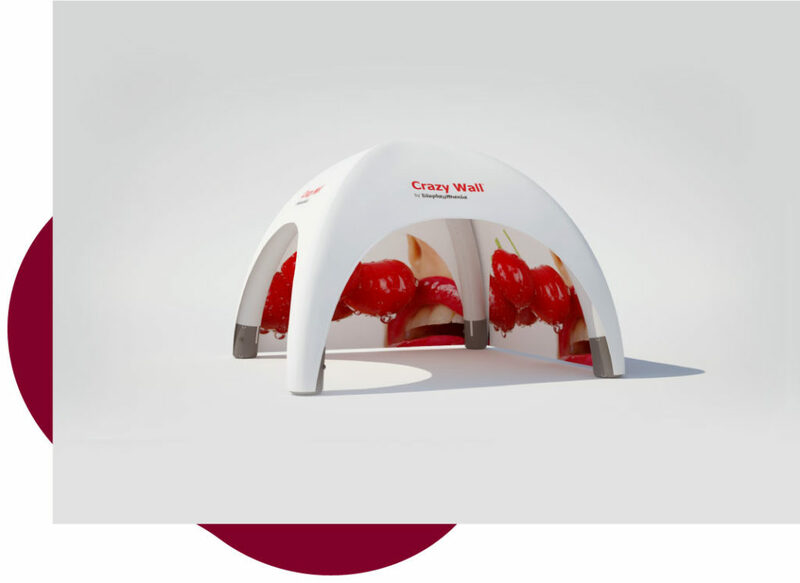 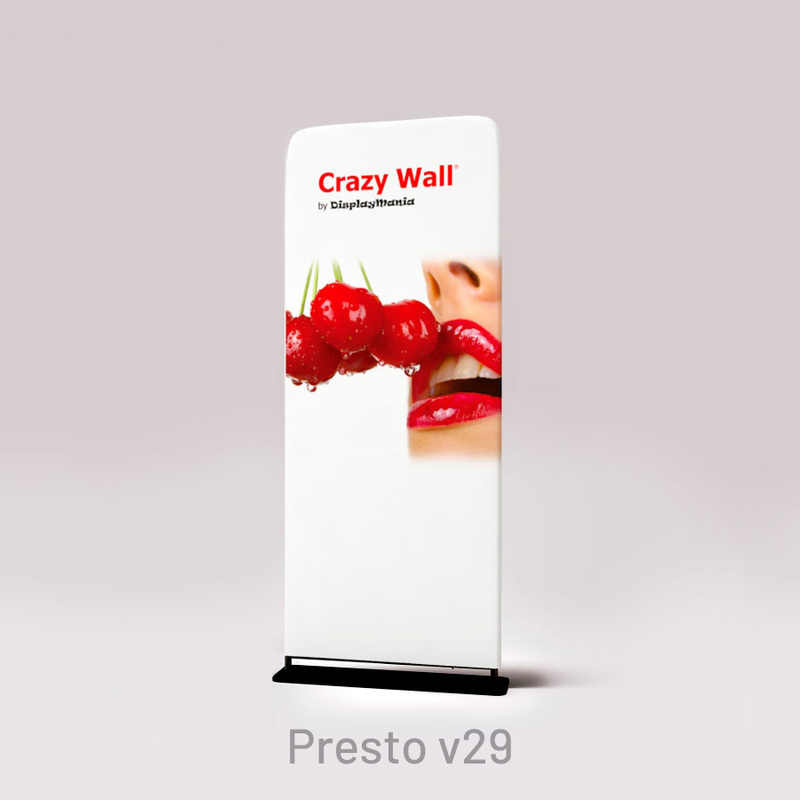 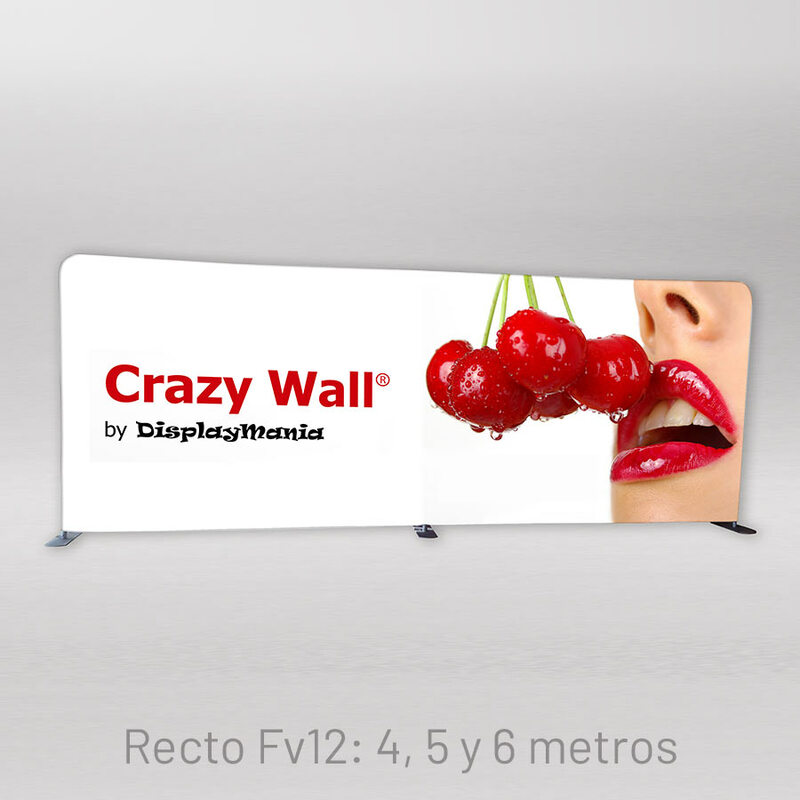 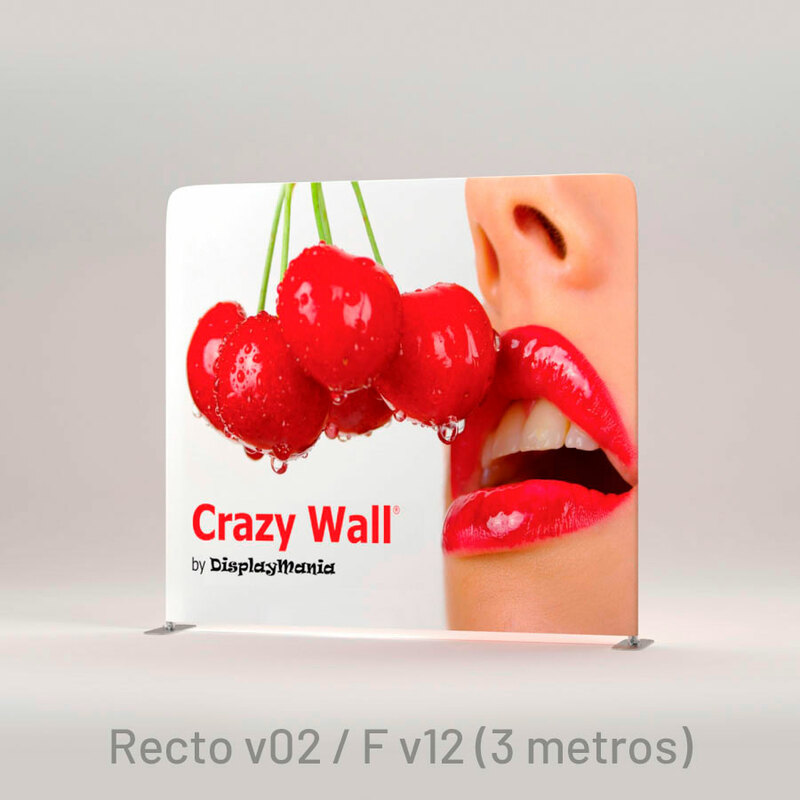 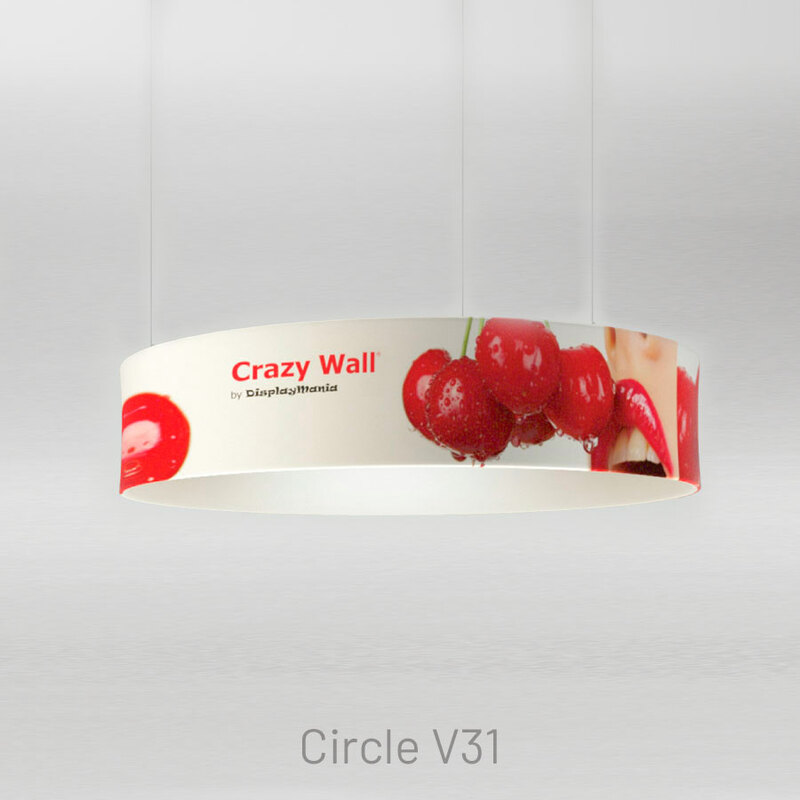 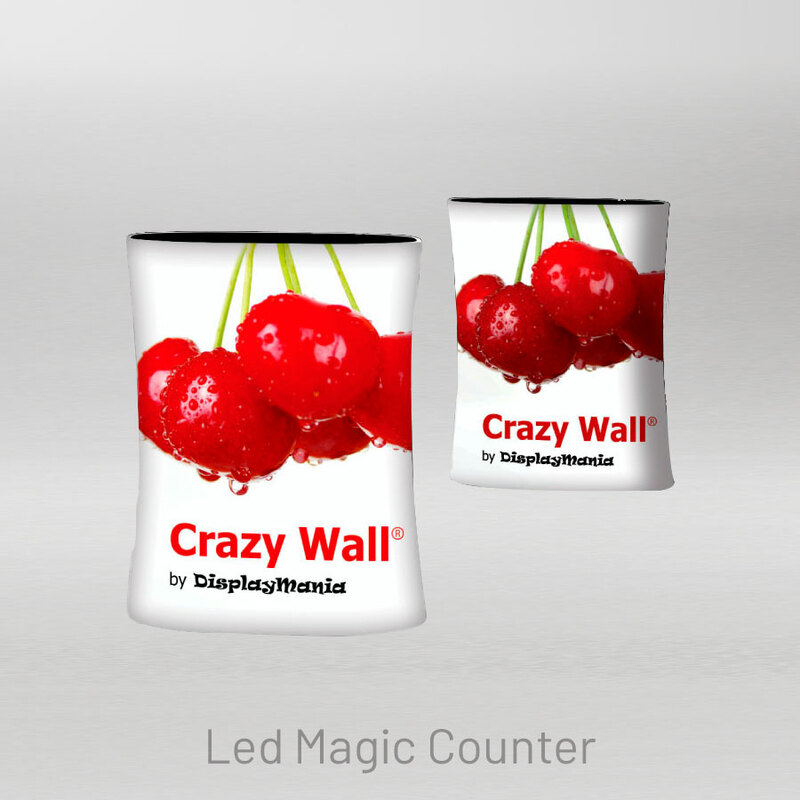 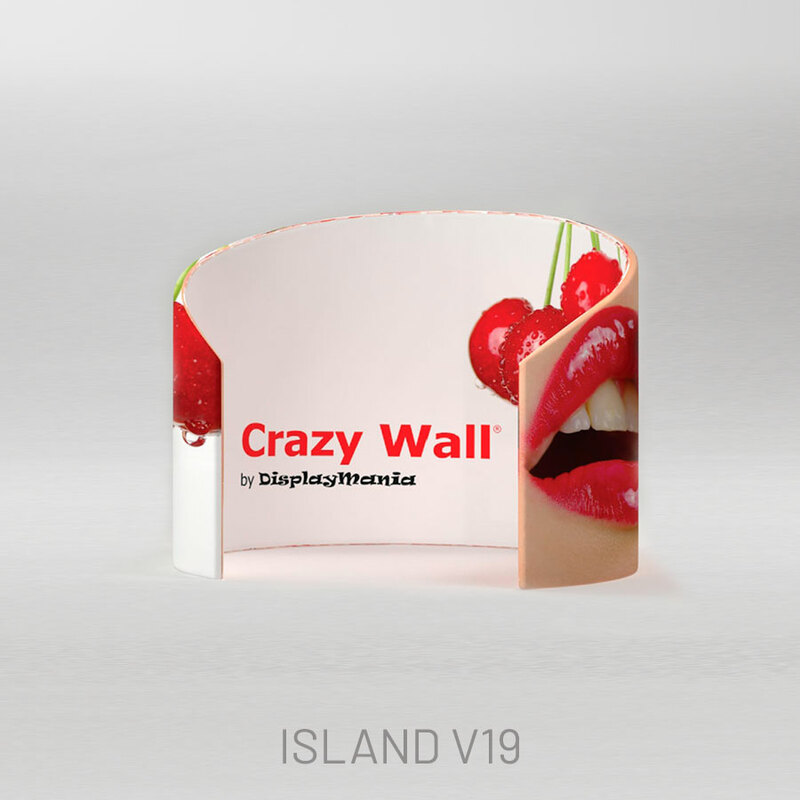 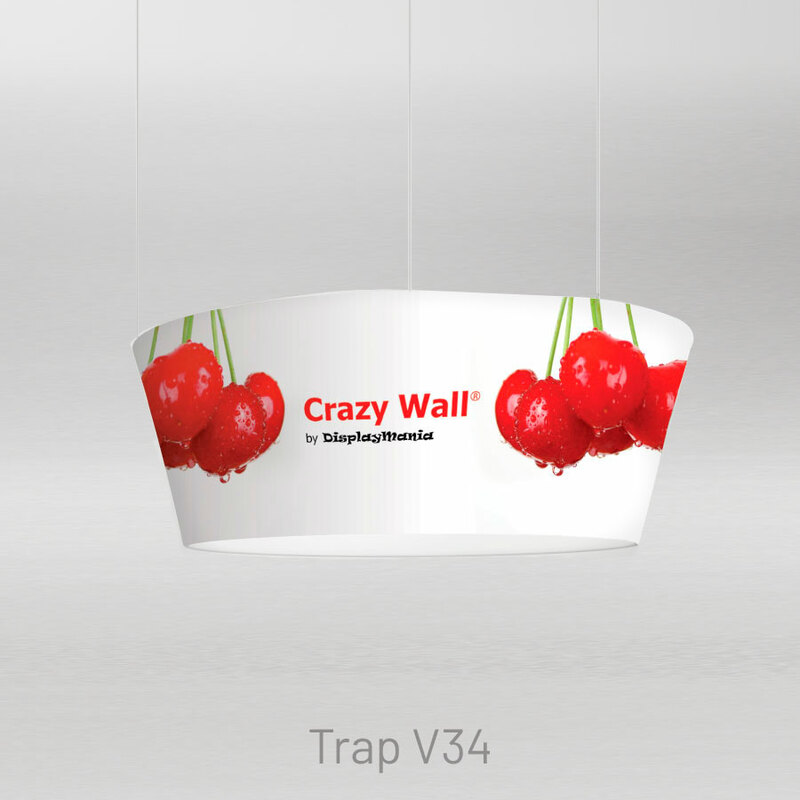 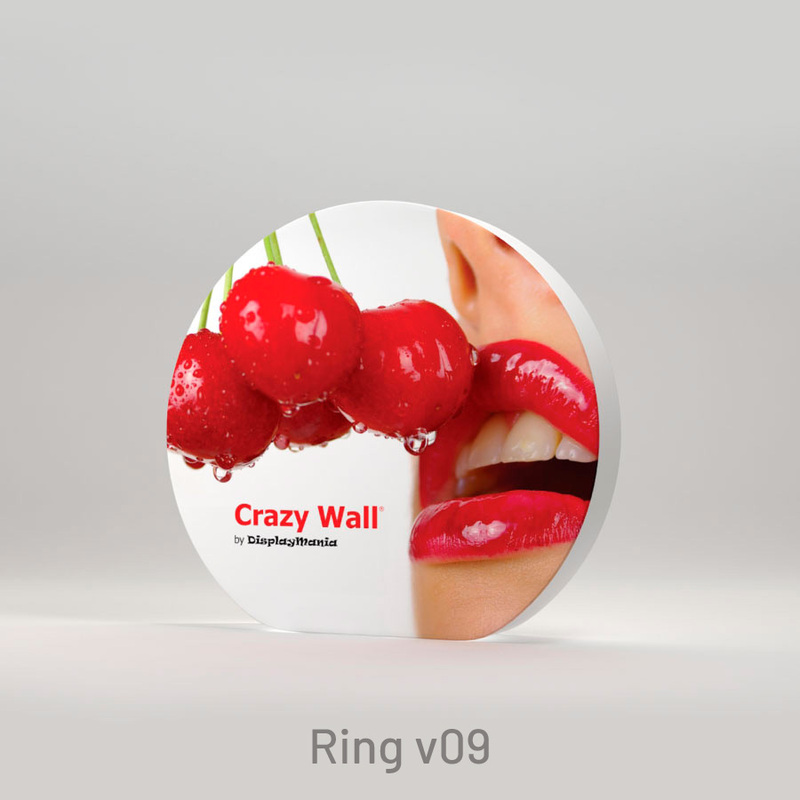 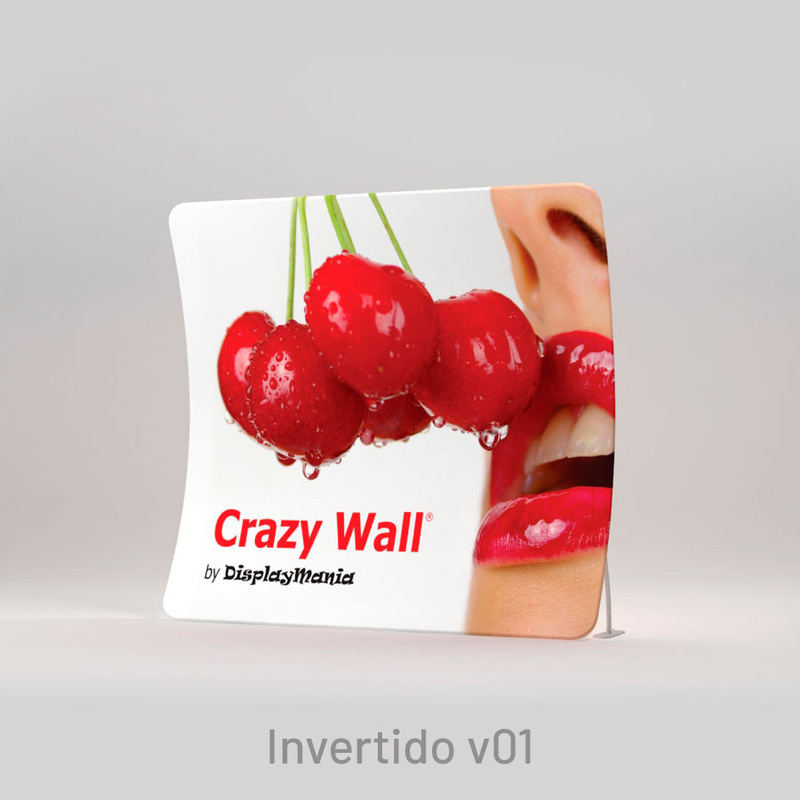 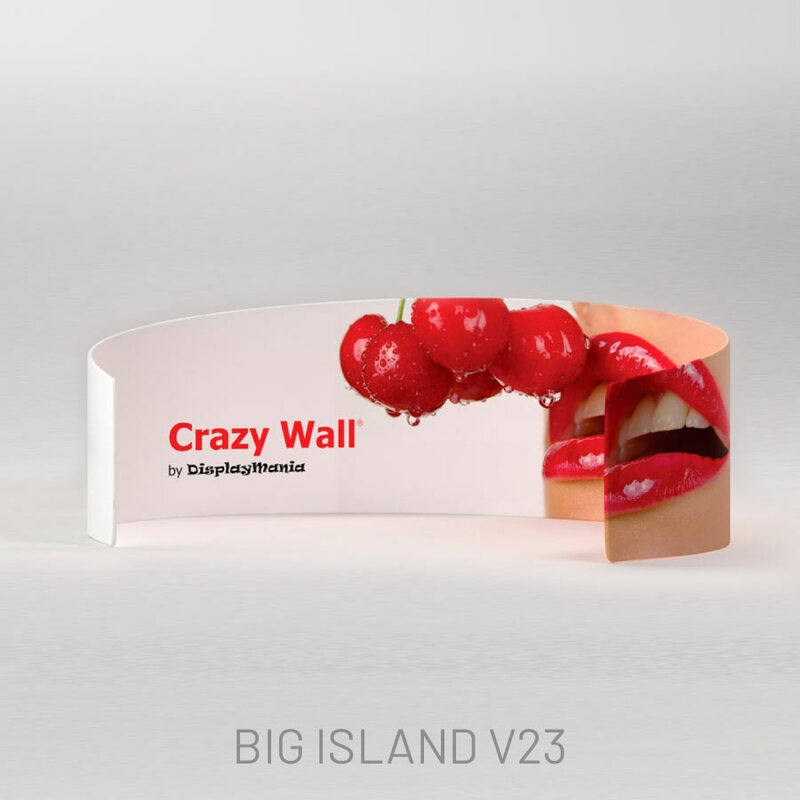 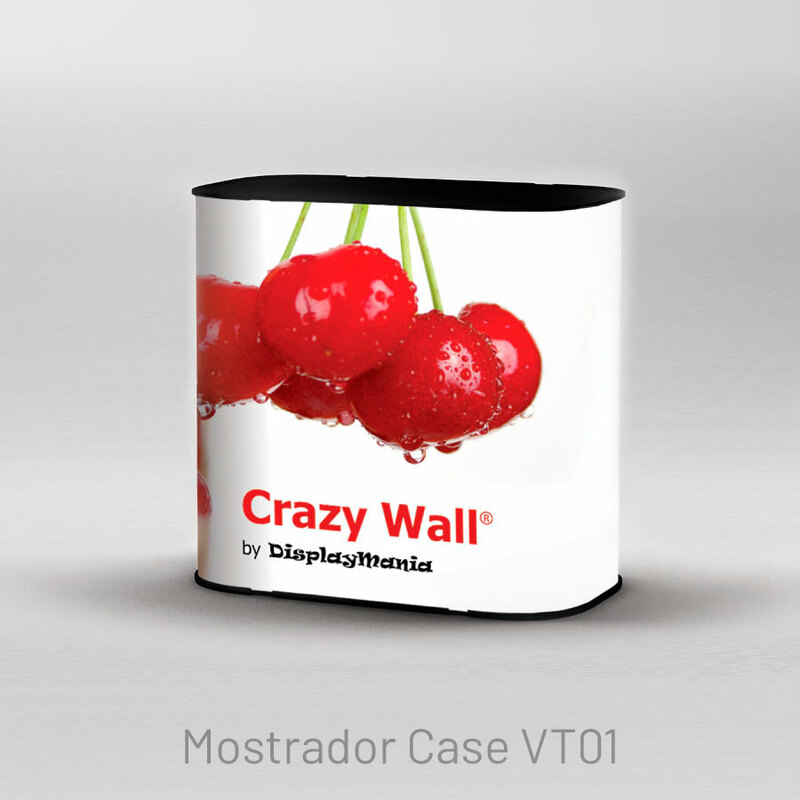 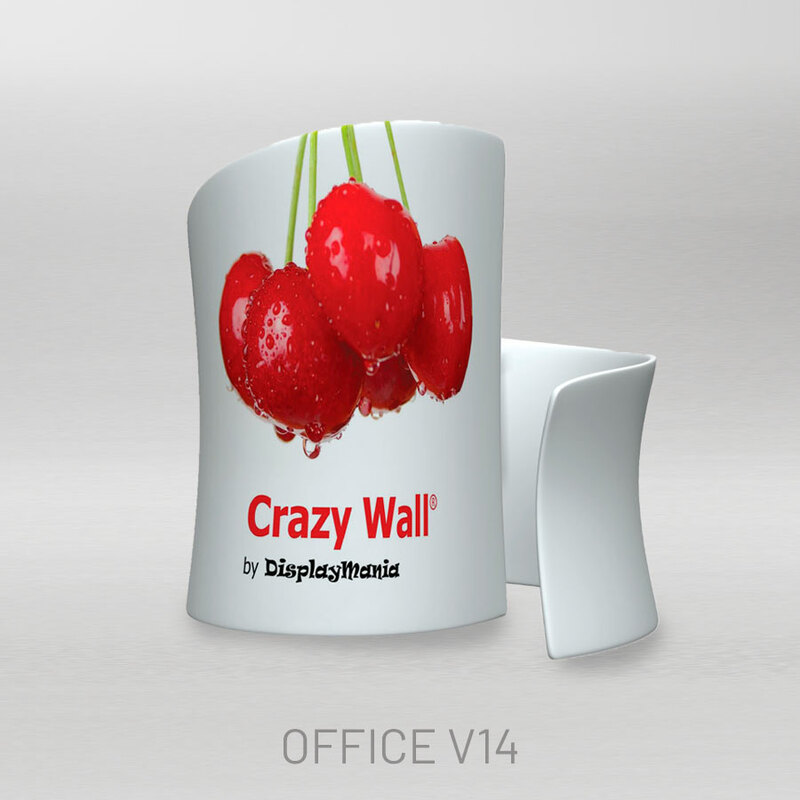 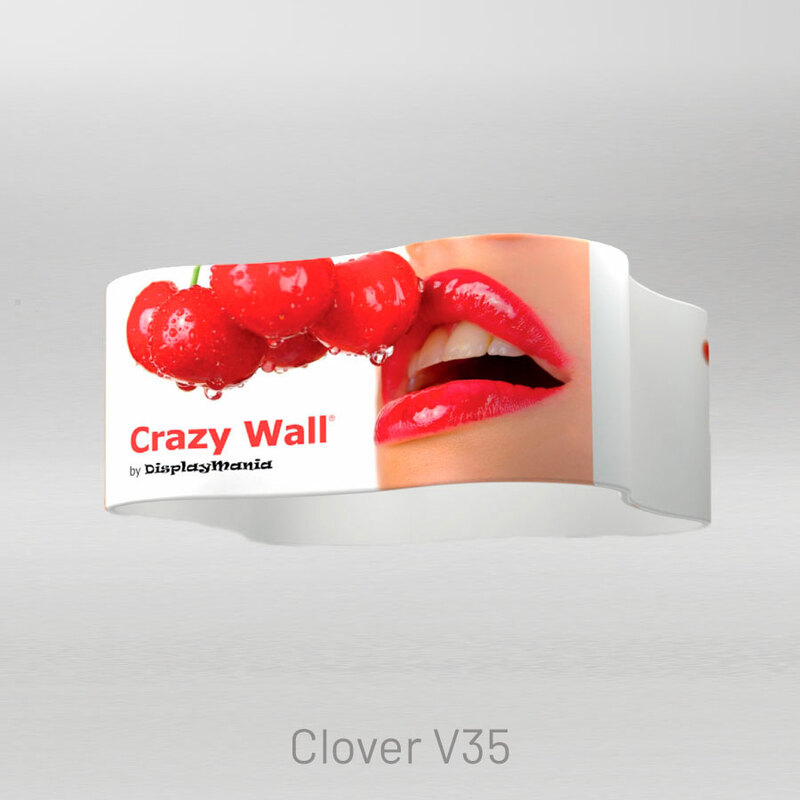 Crazy Wall is a displaymania product. 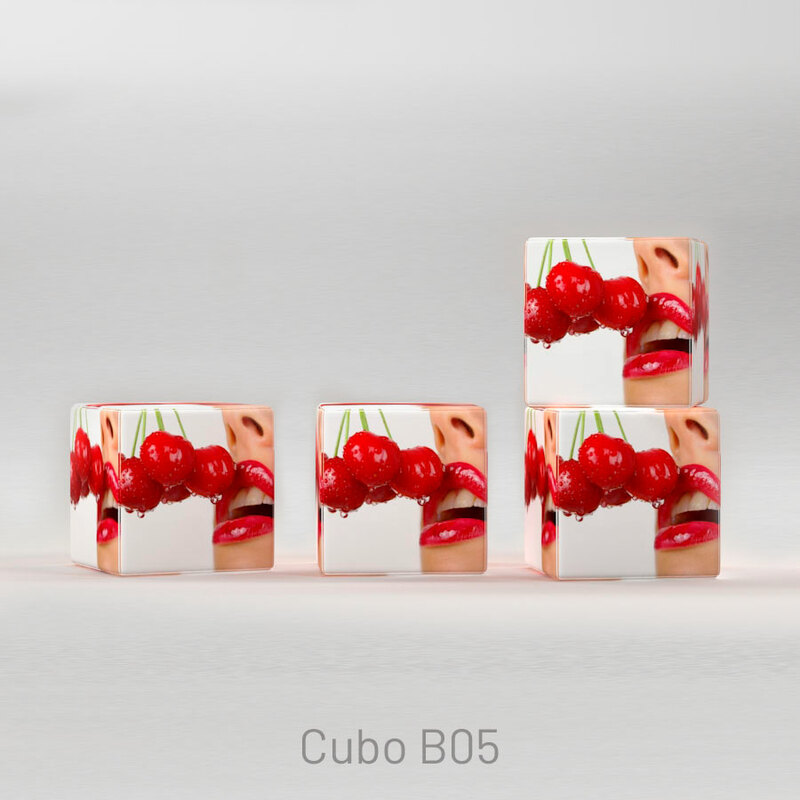 Cubes, rollers, armchairs and sofas. 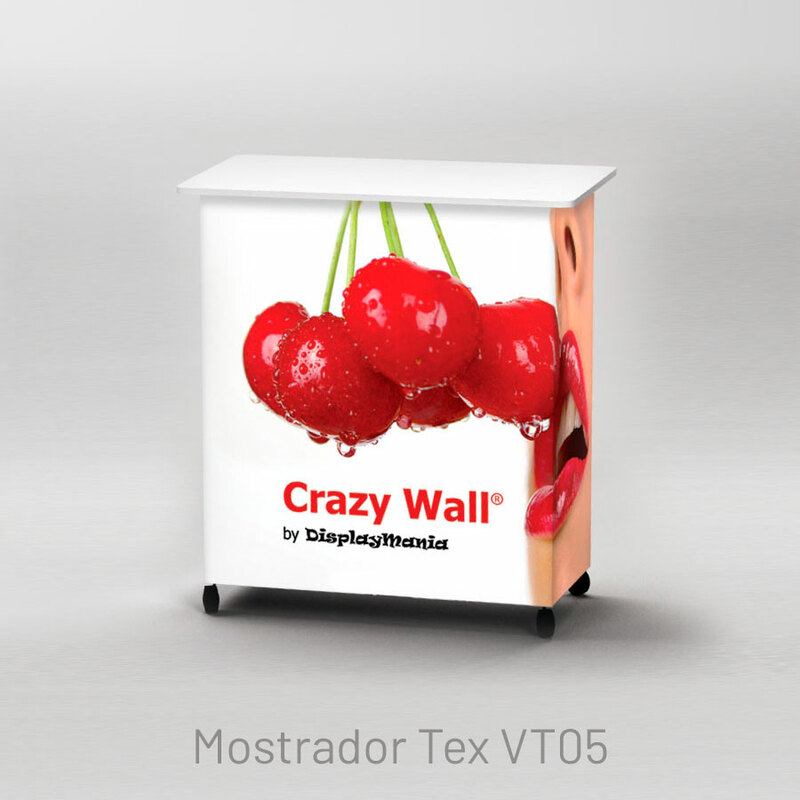 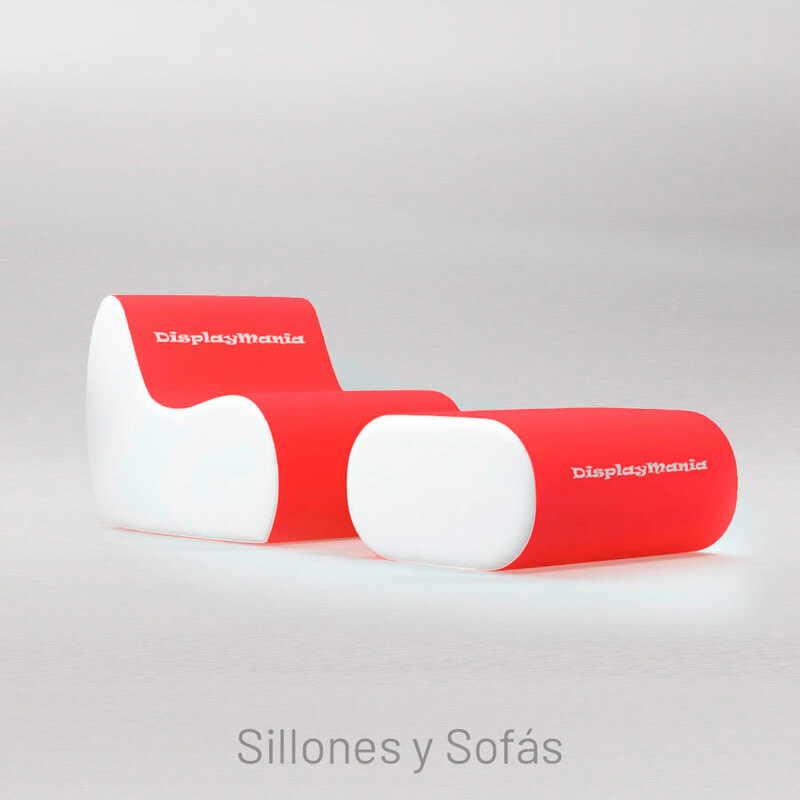 When strength, originality and appeal are a must, furniture units manufactured with high-quality polyurethane foam are the most effective advertising medium for trade fairs, exhibitions, shows and events. 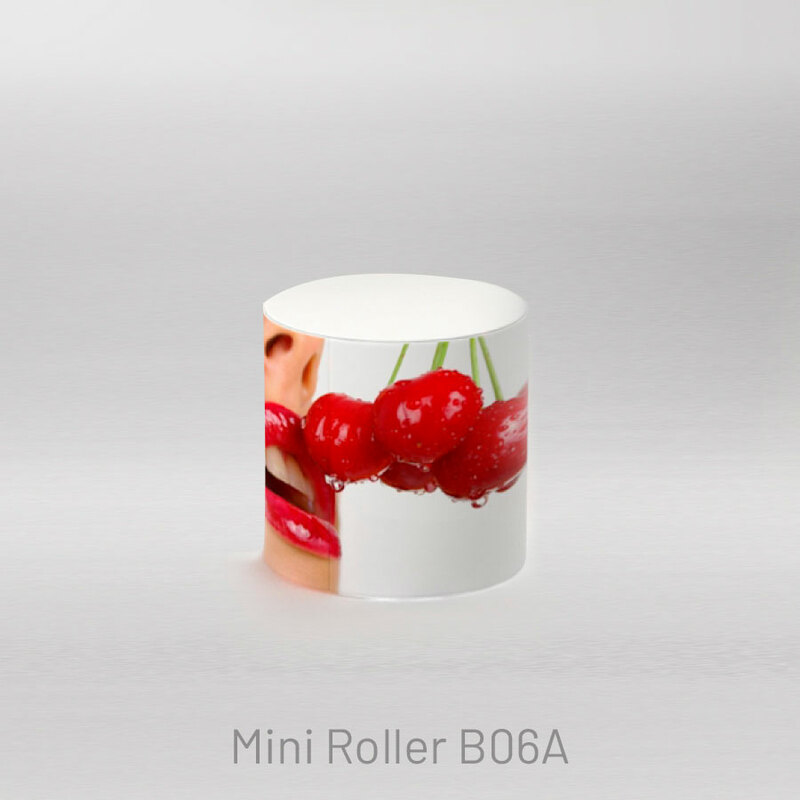 They are water-resistant and their cover can be printed by sublimation to make for total personalisation. 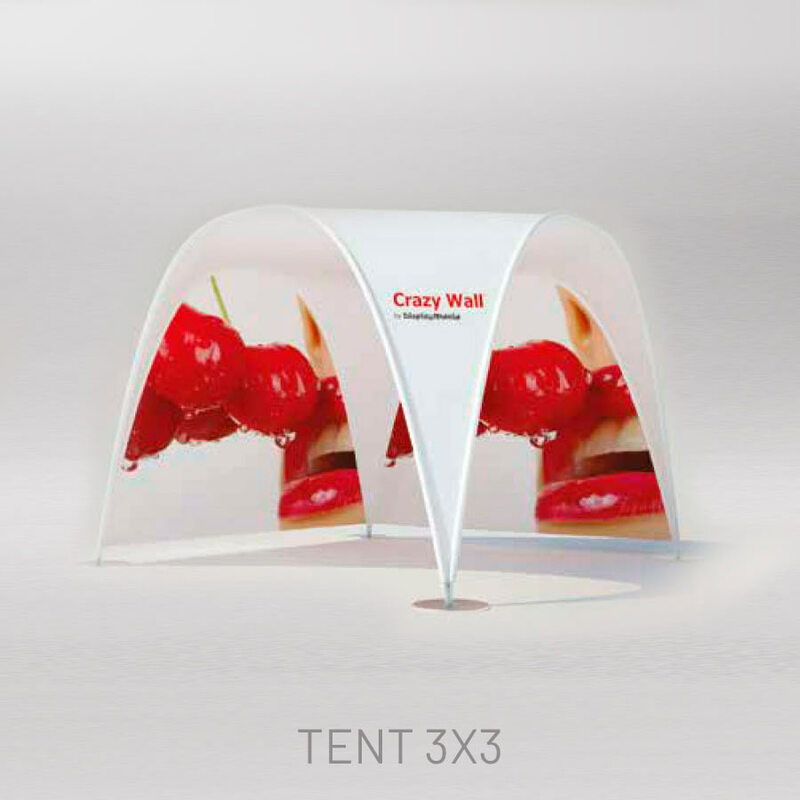 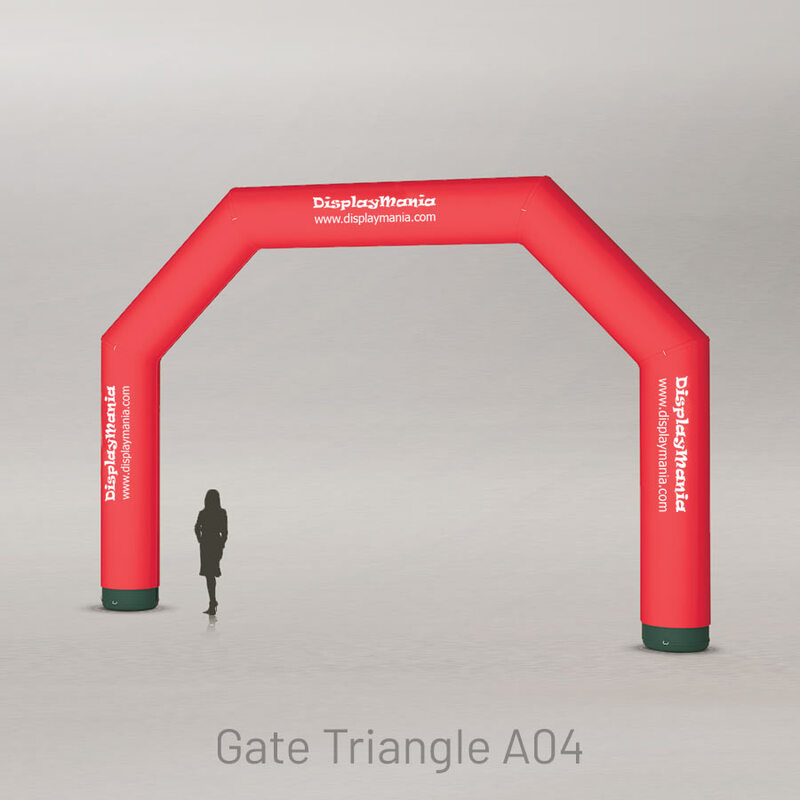 Inflatable and portable aluminium advertising canopies, teardrop-shaped flying banners and air gates and columns will make any outdoor event a moment to remember and will reinforce your corporate image. 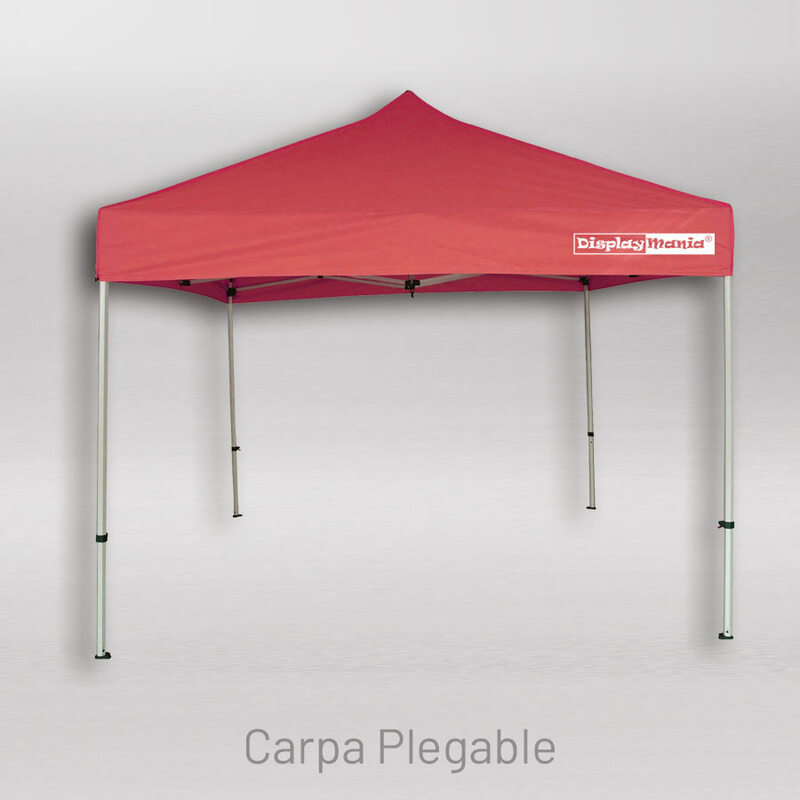 We work with totally customisable and weather-resistant materials. 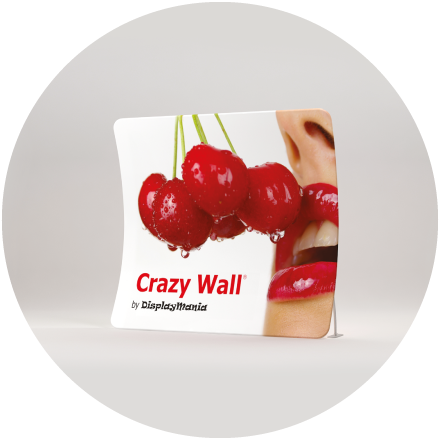 Your new Crazy Wall is supplied complete and ready for use. 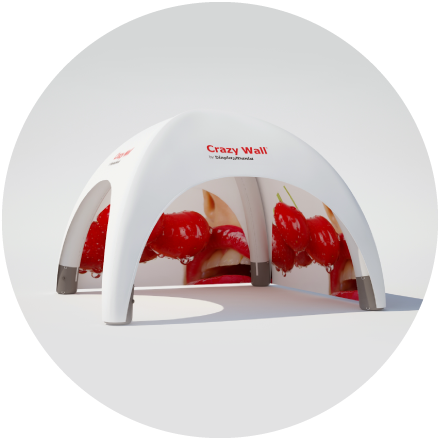 All Crazy Wall products are quick and straightforward to set up, with no need for tools. 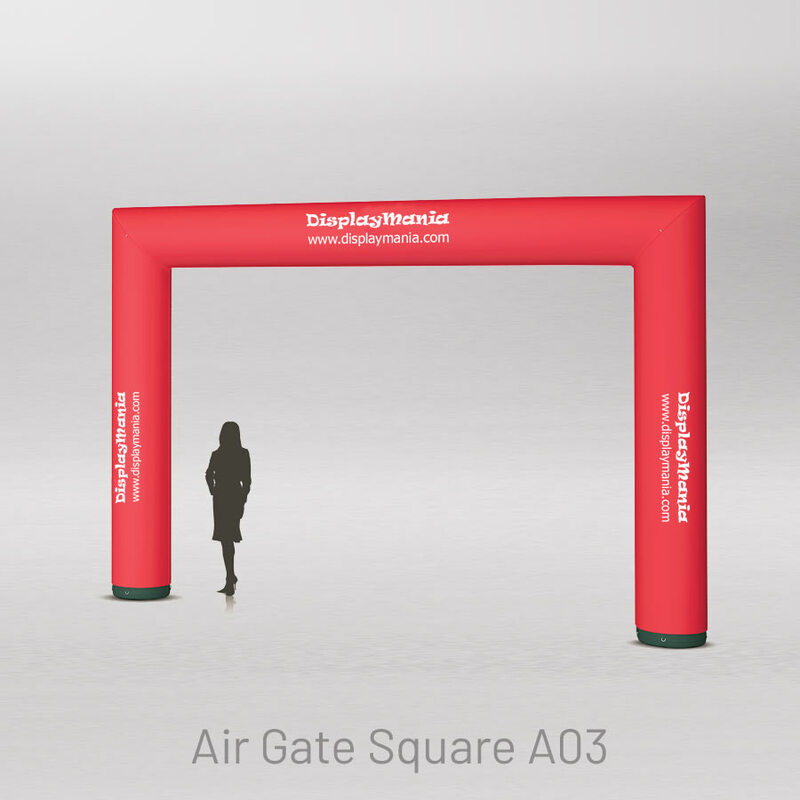 You can also have your displays set up by Displaymania‘s specialised personnel. 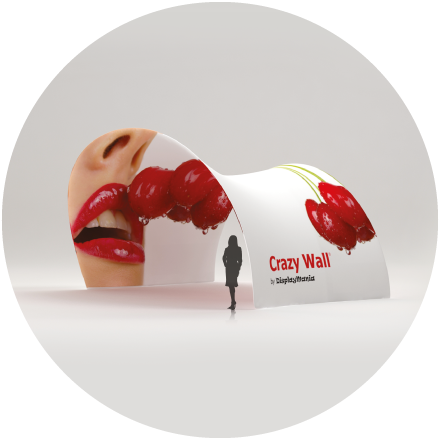 We receive the original files via a download link. 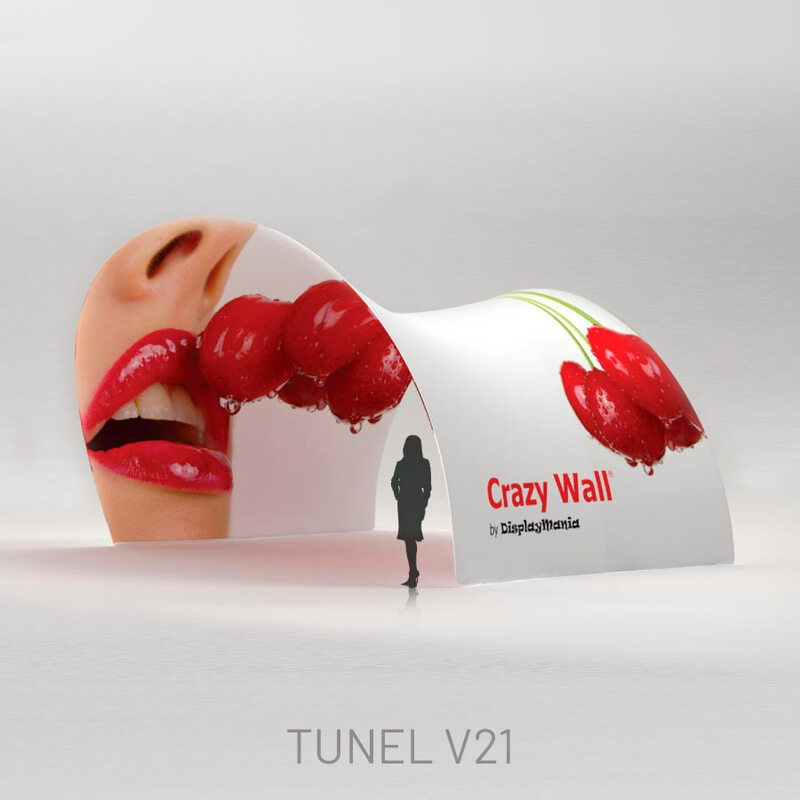 Our design department makes the necessary adjustments so that your Crazy Wall will look perfect. 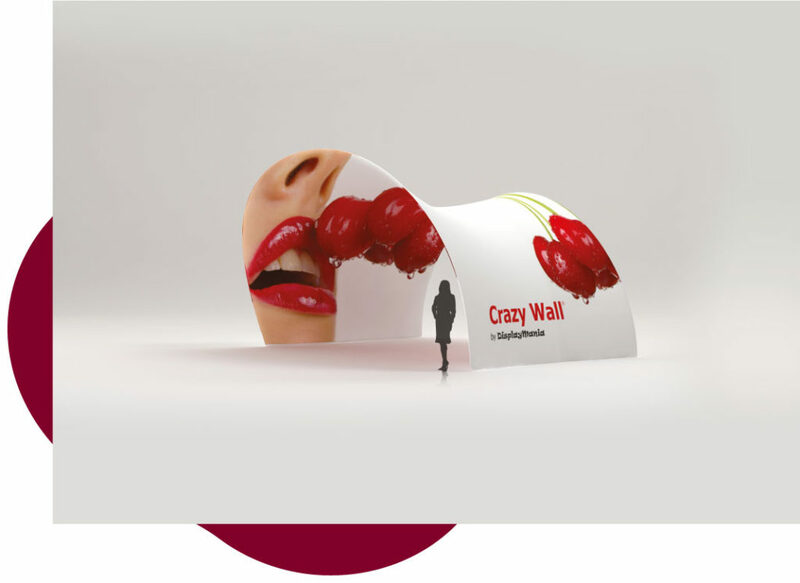 We work in collaboration with our clients’ agencies and designers. 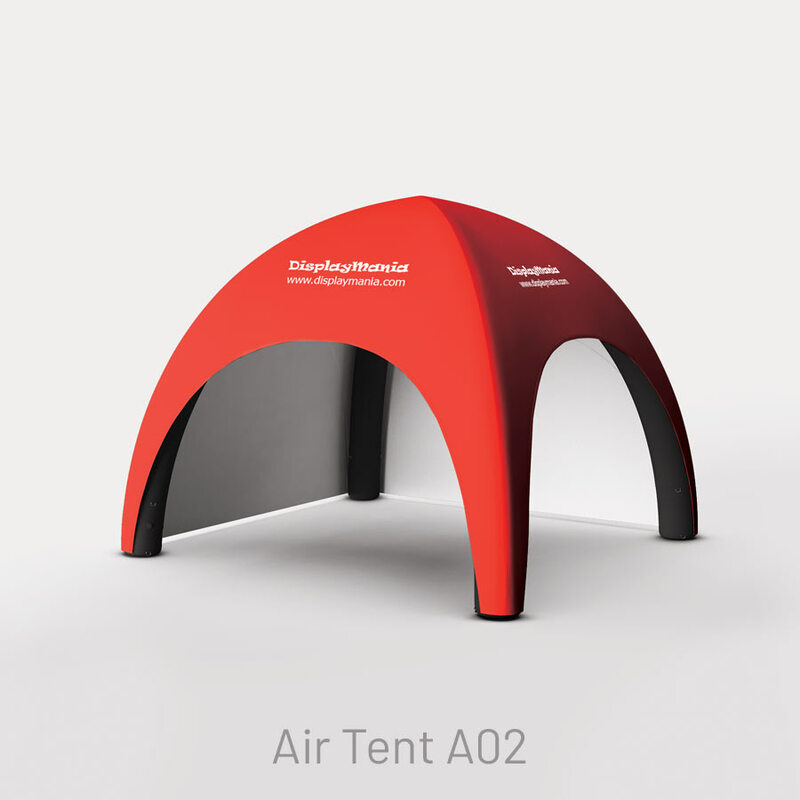 No more having to check your collapsible materials. 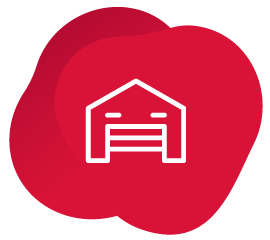 We store and maintain the collapsible materials at our facilities in Barcelona, we have an electronic inventory and take care of the repair and cleaning of materials after events, as well as incoming and outgoing material control and a lot more. 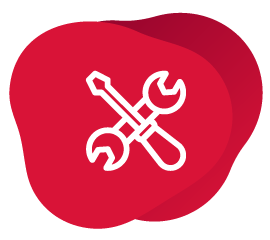 We provide you with a team of highly-experienced professionals in the industry who will work to turn your problems and needs into solutions. 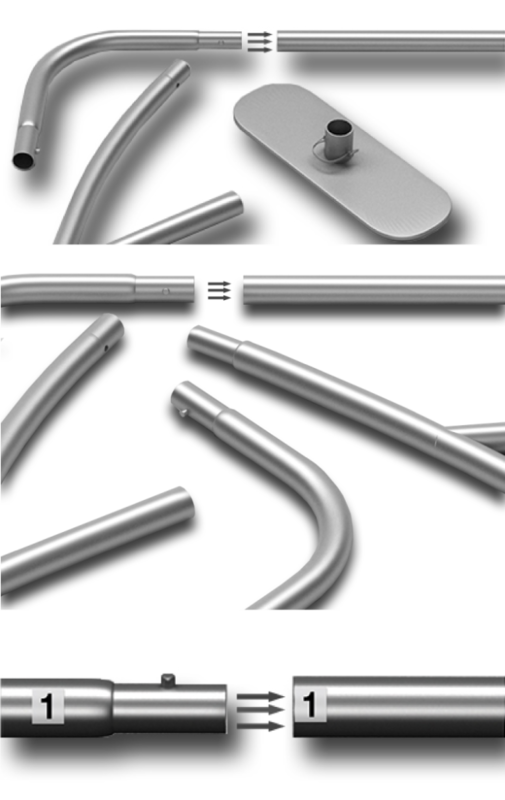 Standard signage support. 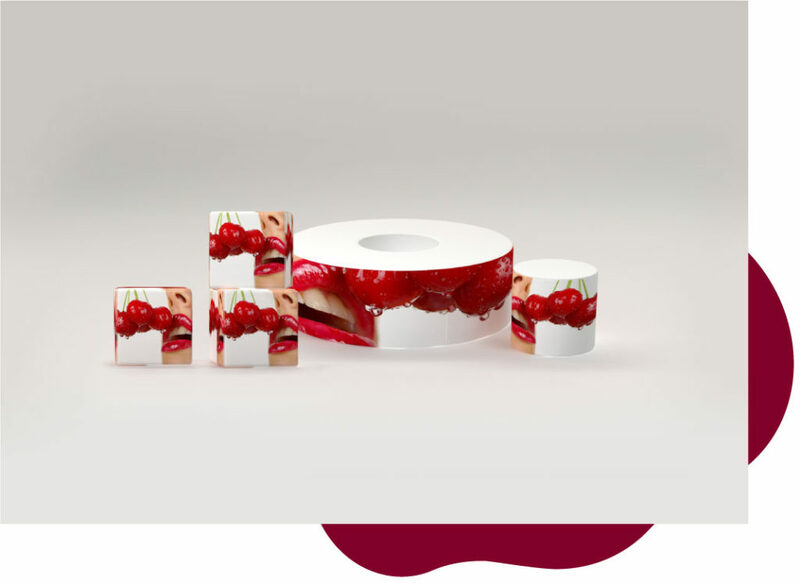 Points of sale. 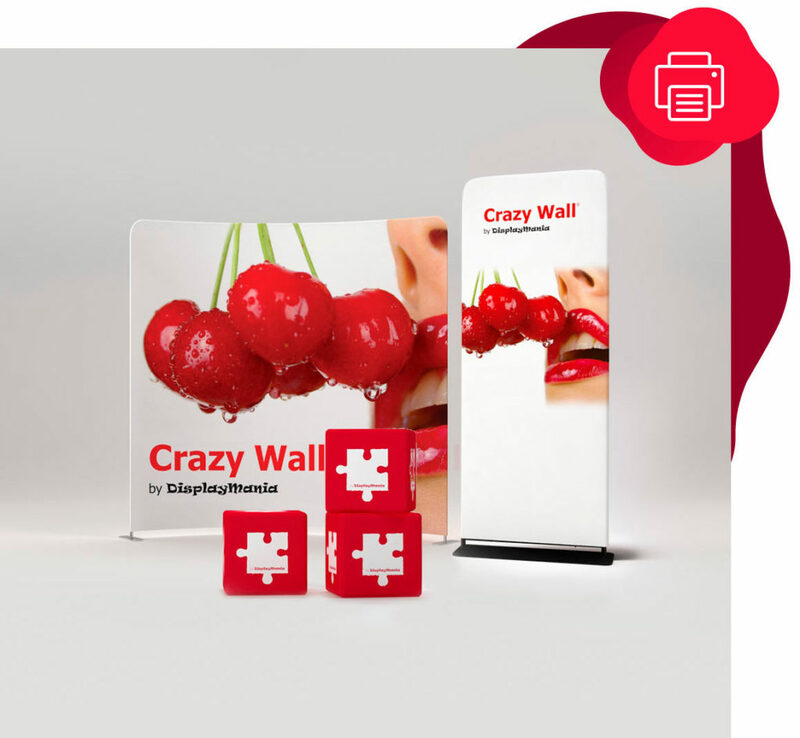 Collapsible materials and reusable stands. 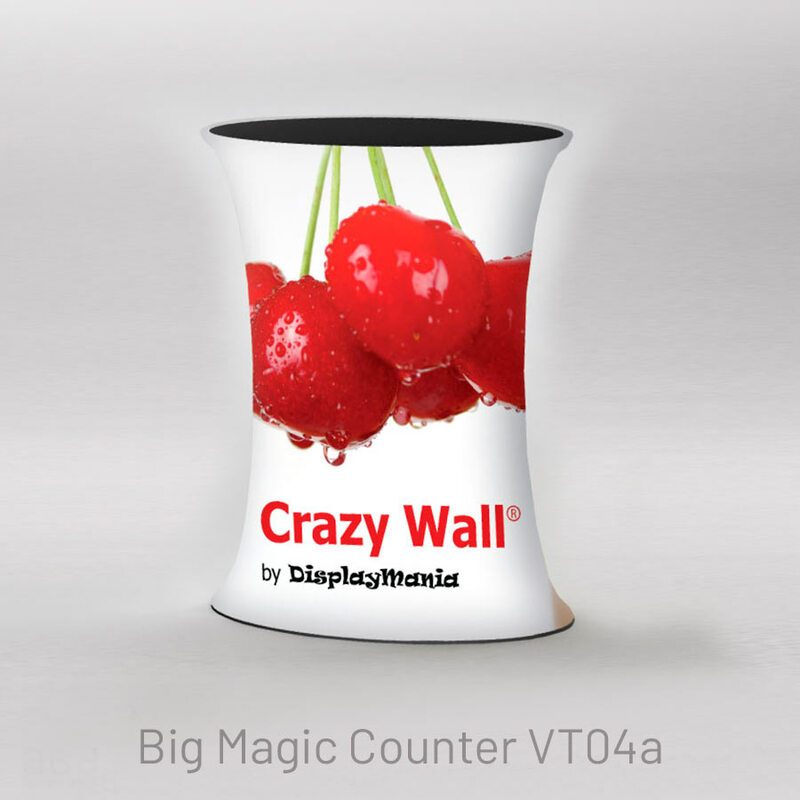 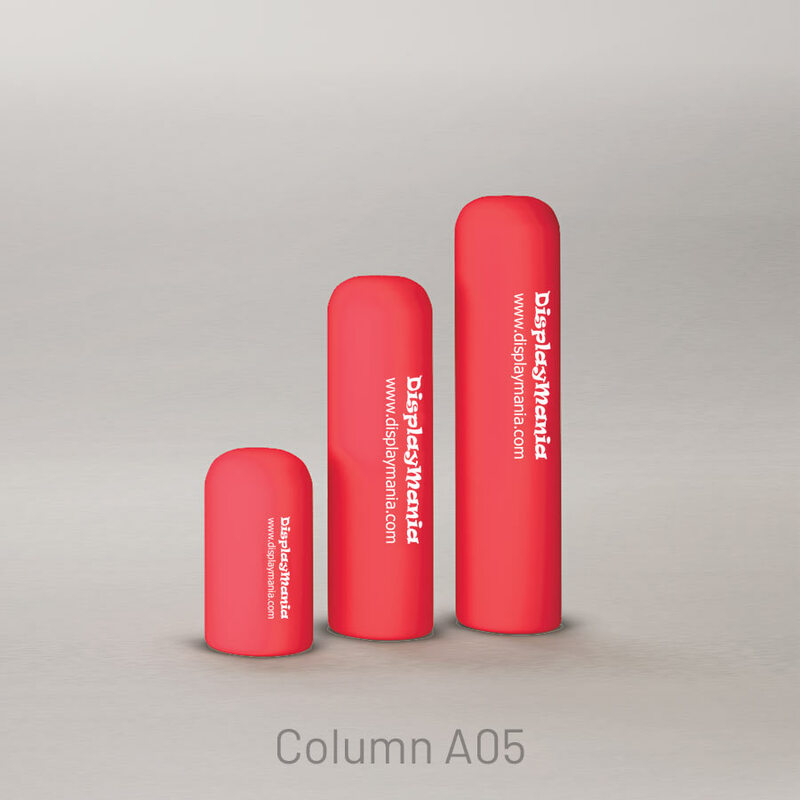 Personalised displays: shelf animation, special for chemists. 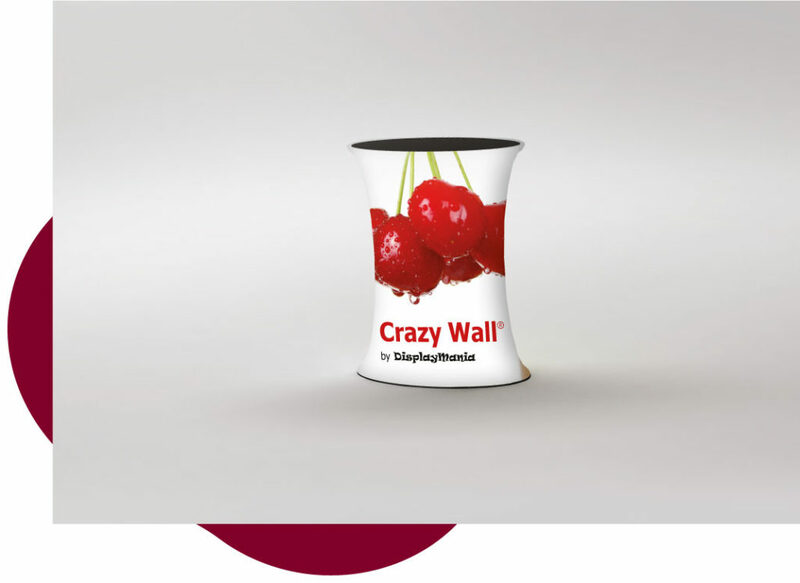 Do you want to download our full catalogue? 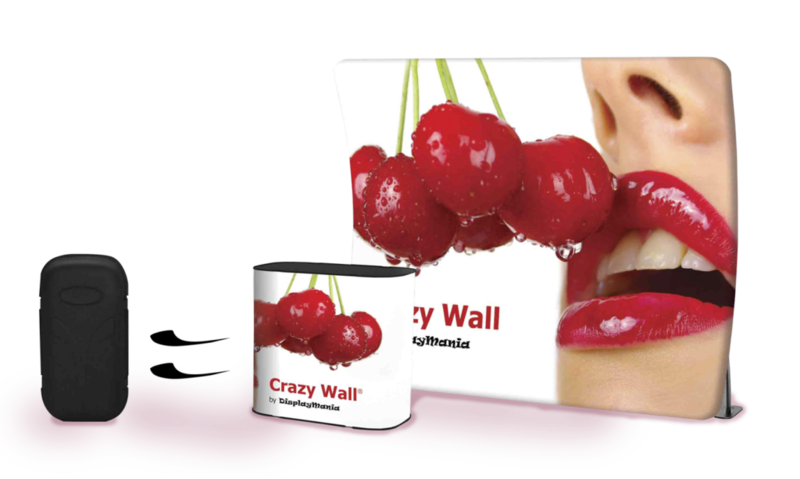 Find out all the product options that we can offer you. 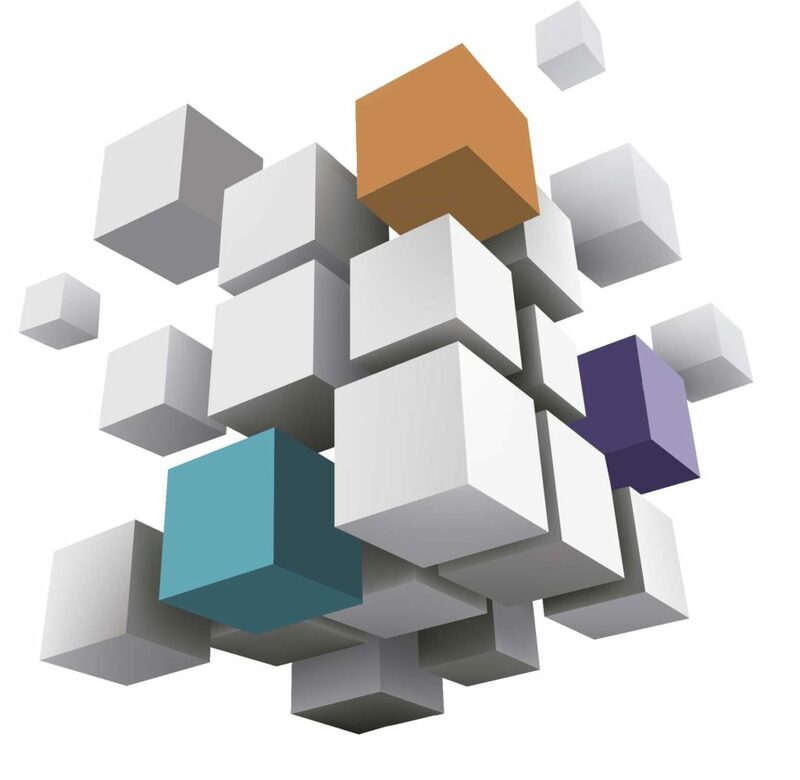 If you are interested, request a price quotation and conditions from our Commercial Department. 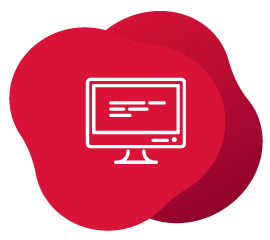 Do you want to subscribe to our newsletter to receive future communications?